I woke at 07h30 to the sound of the lifting anchor chain. The chain with its expected clang was dragging up back into its compartment. Ah ha, I thought, Kev’s got Jules as an assistant and had left me to sleep as late as I wanted. But I was rather sad to leave Mahajanga so I got up and perched in my P.J’s, with my coffee, on the Bimini roof to get a last view of this wonderful town. Filled to the brim with fresh salad, cheeses, milk, eggs and veg we had enough fresh provisions for two weeks. Our fuel tanks were full and armed with all our necessary permits and paperwork we were now ready to sail Madagascar legally. Our next stop was Mahajamba Baie, which was 62 miles north. The mood aboard was very good and Jules was very excited to sail this section up to Nosy Be with us. 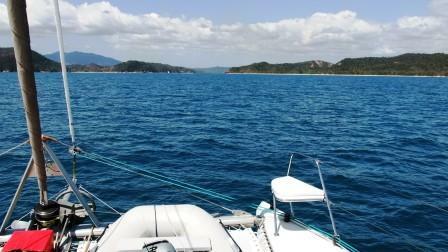 The seas were calm and the winds were generally East South East at 10 knots, so with the screecher up we sailed on. Jules was keen to learn, so the changing of sail combinations was much more frequent than usual, as Kev showed him how to make use of the different winds. Then this one was up, then that one was up, then both, then to the one side, then to the other side. And so they went on and on, the whole day! Man, I was exhausted just watching them! I’m pretty much a put it up and leave it up type so I took the time off to read further on the twilight series, whilst they ran around and gave the winches and their (well, really only Jules) arms a full days workout. The rods were out, and we had two bites but Jules was not able to bring the fish in, practice makes perfect. All that work to reel them in and then just as he gets them to the boat they head for the rudder and wrap around it. More arm exercises! We arrived in the Bay at 16h00 and scoured for a safe protected anchorage for the evening. The prevailing evening winds were South East up to now, so we chose a suitable cove, out of the bay but along the Coast line which suited this criteria. The area has 2 small separate beaches, next to each other, separated by huge sandstone cliffs, with forest in the background. We dropped anchor in 10 meters of ultra clear flat blue water with white sand at the bottom, just 30 meters off the beach. There were no obstacles (bommies) anywhere in sight. Seldom is such an easy anchorage found, where all the possible dangers are immediately visible. As it was not quite in Mahajamba Baie, we called it Two beach Bay. It was a beautiful bay, and you could hear the birds in the forest preparing for the evening. The sandstone rock faces were full of caves, nooks and crannies. 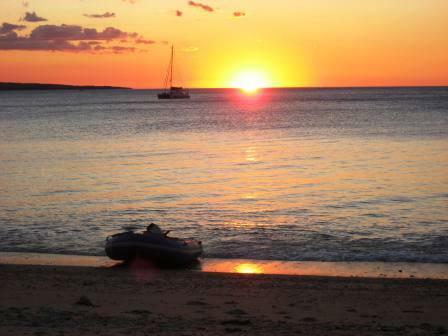 We immediately lowered Landy, packed our sundowner basket and headed for the shore. The 2 beaches were accessible to each other by walking behind or over the sandstone cliffs which separated them. 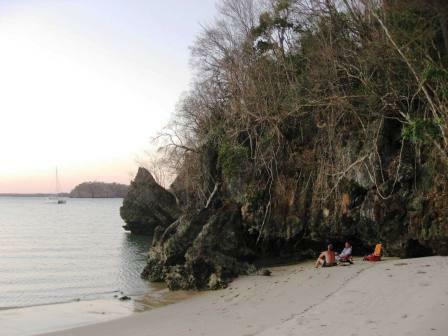 We explored the area and then settled down on the end beach to enjoy the cooler, last part of the day. We were surrounded by the chatter of parrots, and before long, saw the shy lemurs in the trees behind us. We are also lucky enough to see flying foxes, which are actually bats. It was a beautiful serene place and such a contrast after the hustle and bustle of Mahajanga. When we looked again the sun had set and all that illuminated the horizon was the reflection of the moon on the water. We made our way back to Catatude and spent the evening catching up with Jules. This was to become one of my most favourite anchorages, but as we were on a tight schedule, Jules's flight from Nosy Be back to Joburg was booked for next Saturday, it was not possible to stay for another night. At 9h00 we set off for Morambe Bay, into a strong choppy, rough sea. It was 25 miles further up the coast. 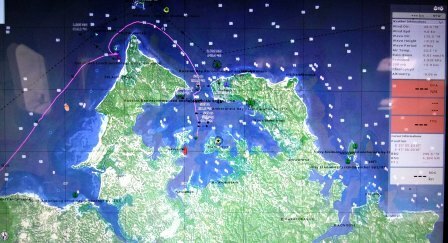 I took this time to enter all the anchorages up to Nosy Be, that were recommended by fellow yachties and reference books and entered them into the Max Sea software. This effort did not go without a Stugeron to keep me upright. 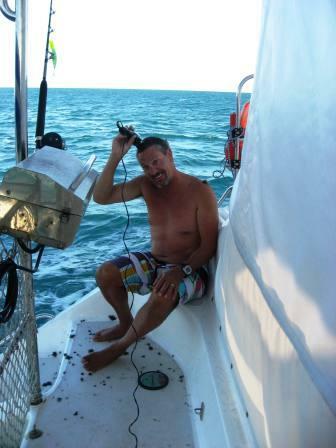 On a long day at sea, the focus tends to be around food and catching up on chores that have been neglected. I also took this time to give myself a deluxe pedicure, which was well needed. I have the paranoia of getting those crusty, hard ’sailors’ heels that I have seen so many yachties with. You can just never have enough cuticle oil aboard. I’m on my 3rd bottle of TipTop! Jules was totally dejected as he lost 3 fish in a row. He fought endlessly to bring them in, sweating and panting, straining against the powerful fish that keep giving and taking line as they tire then regain strength in spurts. As he got the hang of it, his luck changed (yes, there is a lot of luck attached to fishing!) 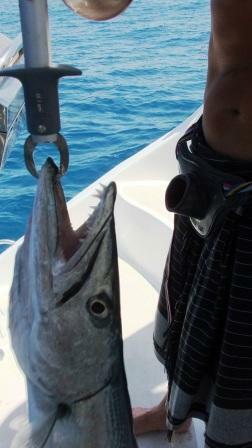 and reeled in a King Mackerel. Kev taught him the routine, of pouring a shot of alcohol down the gills to calm the fish down, removing the hook, then waiting for me to leave before the actual club. Even inside the cabin out of view, with my fingers blocking my ears I can still hear that dull thud. I hate it but have accepted that fish is food and console myself with the fact that we only keep fish to eat and the rest are released, with tenderness and care. Feeling very chuffed with himself, Jules watched Kev fillet the one side and then he attempted the other. In between all this fishing activity the boys were still doing their sails routine that had started yesterday! All day the sail were adjusted, dropped, changed etc etc. The novelty had still not worn off? The Genoa (head sail, the very front one) had to be made smaller (furled in) quickly because there was too much sail out for the amount of wind that had come up. In that instant Kev was winching the sail in on the one side and Jules had to release the sheet (that’s plain old rope in sailing terms!) from the other side. The wind was a bit stronger than Jules anticipated and in an instant the speed of the rope moving through his hand, burnt the palm of his hand as he hung on. He was only wearing a glove on his other hand! I bandaged a gel burn pad onto his palm and needless to say he was rather grumpy and felt very sorry for himself after that! Later that day Jules, with his wounded hand, brought in a Giant King which put up a huge fight (at least an hour of give and take on the line). He was successfully released after the trophy photographs were taken. His grumpy mood subsided by a notch or two! As we got closer to our destination we could see a huge big fire in the distance along the coastline. 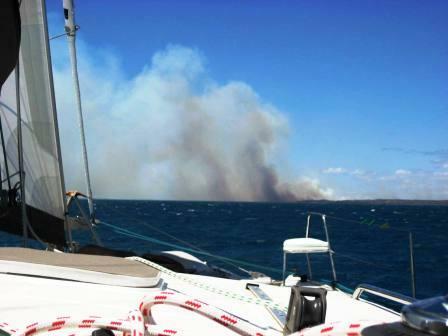 The winds were fanning the fire and the smoke was billowing in huge plumes along the coast. We couldn’t see if the fire was before, after or at Morambe Bay and there was really no alterative, this late in the day, where we could anchor. Finally we passed the fire, but the smoke was blowing North. So as we turned into the Bay, and sailed through the smoky haze to find our anchorage we were greeted with the most beautiful sight. Huge flat sandstone mounds jutting out from the crystal clear blue water, covered with baobab trees and lovely long white, sand beaches in the southern side. We sailed on, in silence as everyone took in the beautiful sights of Morambe Bay. There is a Huge sacred Baobab Tree here, that is protected by the nearby villagers, so we didn’t go to see it without permission. The anchorage that gave us the best protection from the evening ESE winds was against the southern side, off the long beach and so we dropped anchor in 8 meters of water in mud. We, well rather the guys, had phaffed so much during the day with stops every time a fish was on the line or for a sail change that it was rather late in the day when we arrived and unfortunately we didn’t spent as much time here, as I would have liked to, to explore the bay fully. But anyway, we launched Landy, and rushed to the shore and found a suitable shady spot (even at 5pm, the sun is scorching hot and the light breeze in the protected bay did little to cool us down). The rest of the day we spent swimming, exploring and bird watching from our deck chairs. There were Parrots, small black Kingfishers, and several other birds and smaller creatures keeping us entertained. The bay is truly beautiful and deserves more than a days visit, to truly appreciate all it has. It is also devoid of mozzies, which is a huge bonus. Kev had remembered to put our anchor light on, before we left, so we were able to stay on the beach until way after dark. On our return, to Catatude, we had fresh sushi care of Jules. We sat on the deck late into the evening and watched the fire, which had re-kindled, burn fiercely in the distance. 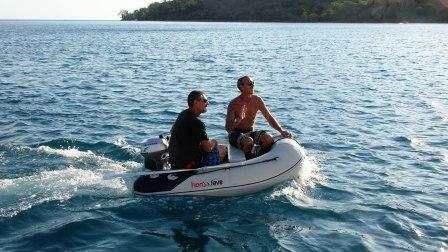 Today we head for the Radama group of Islands. 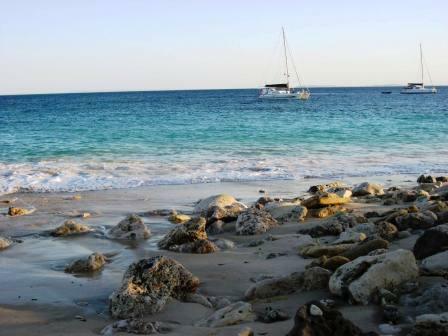 The Radama group of Islands consists of 4 Islands, and are reported to have some of the best diving and snorkelling sites in Madagascar, so we are quite keen to get there. We left at 6am, snuck through the smoke curtain which was still blowing from south to north, and set course for Nosy Lava (Long Island), where we planned to stop for lunch. Nosy Lava, houses the Maximum Security prison of Madagascar. In 1993, a Yacht called ‘Magic Carpet’ anchored off this Island and two escapees from the prison, swam to the yacht, killed the occupants and sailed to the mainland in a daring breakout. Perhaps, I will be lucky enough to meet Michael Schofield - Hey girls? Moving on. With full Genoa up (the front sail) and 20 knots of wind and the sea from the beam we were cruising at 10 knots and making good time. My delight for the week happened before my eyes. I have a bad habit of laughing at the misfortune of others but anyway, I was in the salon (lounge area), in the upper galley looking down onto the lower galley section. Julius had just stepped down into the lower level where he opened the sliding cupboard, (we work on a help yourself, if you need a snack basis) and was busy selecting his choice of breakfast bar from the cupboard (there are several brands and flavours to choose from). He had his back to me. Suddenly Catatude jerked (must have gone over a large wave or something) and the large silver gas kettle which was on the upper level where I was, bounced off the shelf. I watched it go up, then across, then down and saw that its aim was dead centre of Jules’s head. It hit Julius square on the back of his head, with a loud thump! Ha ha ha ha, Water dripping everywhere, Ha ha ha ha, the kettle and lid clanged to the ground. Ha ha ha ha. He ducked (but too late and probably instinctively) then turned to look at me his eyes wide with astonishment and shock. I couldn’t even speak I laughed so much. I couldn’t apologise. I couldn’t contain myself. My laugh is rather loud but he silently picked up the kettle and placed it back on the upper level, and said “I was just looking for a breakfast bar”. Ha ha ha ha, the more he spoke the funnier it became. Kev came to see what all the commotion was about but I was laughing to hard to even explain. Jules then offered the explanation to Kev that he was scratching in the cupboard, I saw him, and that I threw the kettle at him! Kev was astonished, and gave me the this is my brother you are mistreating glare, which made it so much funnier! It took me about 2 hours to settle down and the tears of humour just wouldn’t stop. Ha ha ha. Man, I spent the rest of the week laughing at the story. Its still makes me laugh! Don’t take things out of my cupboard or rather ‘watch you back’! We caught 3 fish for the day, 1 for Kev, a nice size King which we kept, 1 for Jules, a king mackerel which we released and one rather long flute fish, which we released. We arrived at Nosy Lava a little early for lunch so we used the time to have a dip in the warm blue water. One cannot see the prison from the shore but there are several guard houses scattered around the perimeter of the island. I’m not entirely sure why Madagascar would want to use such a beautiful spot for a prison but perhaps they have considered mental anguish as an added punishment, and for that reason have built it here. 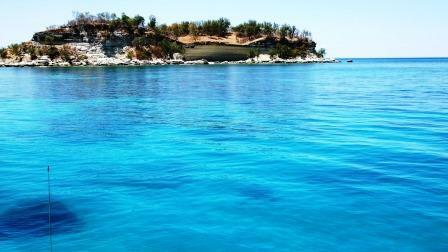 This has to be the clearest blue water we have seen thus far in Madagascar (almost as nice as the inside of Bassas). It took some time to find a suitable anchorage because of the amount of bommies in the water but directly opposite the lighthouse we found a beautiful clear sand patch where we dumped the anchor. After lunch we lazed around awhile before moving on the last 11 miles to our evenings destinatio n, Nosy Shaba (or Saba as some charts call it). Life still goes on, even though we are constantly moving, and Kev took the time to give himself a haircut. He said it was getting too hot, and wanted a shorter cut. Of course Gabriel (our autopilot) is entrusted with the steering whilst we are busy with mundane day to day chores! On arrival at Nosy Shaba we were greeted by rather milky blue water and decided upon an anchorage, with a sandspit on our right and the island on our left. We were anchored somewhat closer to land than usual in 6m of water, but it was low tide, so it would get better not worse. Kev wanted to anchor further away but I wanted to be close, so just to keep me quiet he anchored half way between my choice and his choice, a compromise. The beach had very white sand with large piles of shell bits and coral chunks, strewn all along the high-waterline. We could have swam ashore, we were that close, but instead we rather lowered Landy and set off to the shore to enjoy what was left of the day. We explored the beach and the offerings that the sea had washed up and spent the rest of the time swimming, tanning, drinking, reading and chatting. Another Catamaran joined us and anchored next to us, just as close to the beach as we were. 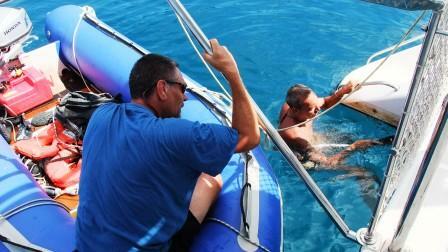 It was a charter boat and the skipper, a French Malagasy, named Sabastian came to introduce himself to us and chat. Later back on board, after dinner, Sabastian came aboard for a whiskey, and a chat. He gave us diving co-ordinates for Greg’s wall, a dive site further north which has a tunnel, 40 meters long under the sea. I like diving, but a tunnel of 40 meters, at a depth of 20 meters?, well perhaps one day? We had chicken, which we purchased at Mahajanga, for dinner, and little did we then know, that this would be the last decent chicken we would have for many months. The chickens here are not the same as in SA. They have ultra long legs, which makes the drumsticks twice as long as we are accustomed to, and they are very thin. More like a starved turkey. I’m heading straight to KFC/Nandos when we arrive back home. It was Springtide (when the tides are very high and very low). We woke to a scorching 28 degrees at 06h45. This meant that it would be at least 34 degrees by midday. Kev complained that he had, had a bad nights sleep due to us being so close to the beach and that he had to keep on checking that we had not drifted towards the shore, throughout the night. He vowed never to anchor this close again. I got the ‘this is your doing’ look which I have learnt to ignore. We decided to check out the info we had received from Sebastian’s on the dive-site just off the Island, so we launched Landy and putted up and down over the now clear and partially exposed reef. As it was spring low tide, we had very good visibility and it was almost as good as actually diving the reef. 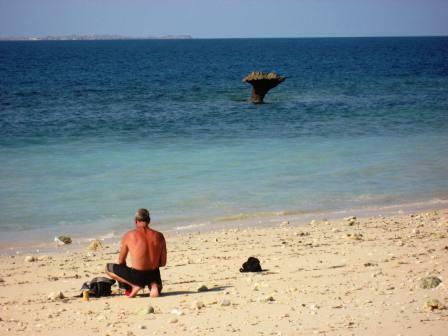 We once again went ashore at Nosy Shaba as we could explore further around the perimeter due to the low water. The complete northern face of the island, which consists of a sheer honey coloured sandstone cliff, had started to cave in. 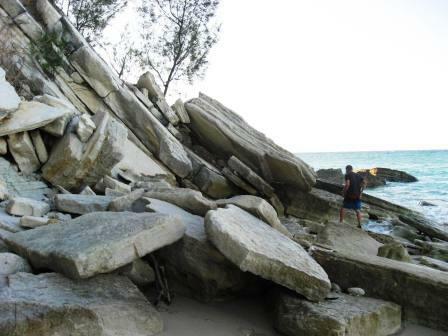 Huge sheets of rock are in a pile on the beach, busy being eroded by the sea, to make new beach sand. As we had to move on, we all had a quick last swim at 07h45 in the beautifully clear warm water, and watched as Jules got dunked by a wave. He came up with the same shocked expression as when the kettle bounced off his head! His visit was proving to be very entertaining and the source of much humour for me. Back on board Catatude, we lifted Landy back onto her perch and gave Catatude a quick deck wash with fresh water. Both Lexy and Landy were also given a good rinse. The salt deposits were really starting to pile up. 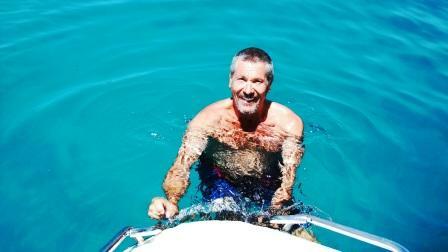 We used a full 400l on the boat wash and our personal showers – thank goodness for the water maker. I don’t think I would be able to do this cruising thing without a constant supply of fresh water. We make at least 400 litres at the beginning of every third day and it takes 3 hours to make. By 09h00 we had had breakfast and were ready to go. We are heading for Nosy Kalakajoro, with a stop off at Nosy Antany Mora for lunch (this way we get to see all the islands in the short time we have available before Jules’s flight home). As we rounded the south western side of Nosy Shaba (it was a really wide berth due to the reef running quite far out) we saw a runway and a fancy looking lodge on the other side of the Island. Today, we realized, that after every phone call that we get from Julie (2nd eldest daughter), we get a bite on one of the rods. She has the unwitting, mental telepathy via satellite phone or cell phone signal to lure the fish to take the rod. 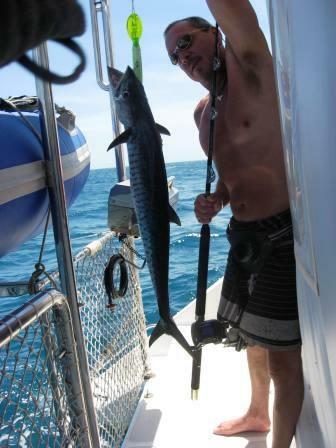 Directly after she called today we had a Barracuda on the port rod and soon thereafter another barracuda on the starboard rod! During the day we also lost 2 lures. These things go like hotcakes, you never have enough. At Antany Mora we anchored for a sushi lunch, it is a very nice anchorage and looks like it could have spectacular diving areas. We all had a long cool swim, in the clear azure waters. I was sorry that we were not able to overnight here, as its a paradise Island. We continued on to Nosy Kalakajoro and everyone was just lazing about reading, tanning and deep in thought. It was then that Kev jumped up, off the trampoline and raced to the helm. We had nearly had an accident and rode over a pirogue! They saw us heading straight for them and realizing we had not seen them, they rowed frantically to get out of our way, all I could see was the whites of their eyes! Kev slowed Catatude down and we called them over. We apologised and gave them water, caps, some sweets and some tinned food. They seemed very happy and waved enthusiastically as we departed ways! Gee, that was a close call – you just can’t get complacent even if there appears to be nothing about for miles! Close to shore there are severally bommies to cross if coming from an easterly direction, but we were coming in from the South so we had a straightforward, clear path and finally dropped anchor at 15h00 in clear blue water, 7 meters deep. We were anchored aside another Cat, quite close to the beach and the guys wasted no time in launching Lexy (we decided to use her, so that her motor could get some action) and heading to the shore. I on the other hand stayed aboard, giving the brothers some bonding time together, and because I was on book 4 of the twilight series and it was getting really interesting. Half an hour later Kev, pulled up in Lexy to fetch me. They had found a small hotel with a lounge overlooking the eastern side of the island. The lady was exceptionally friendly and gave me the hotel tour, including a peek into the chalets and a rough overview of the island. What a pleasant little hotel (Tsara Lodge, Kalakajoro), with all rooms sea facing, each with its own gate leading onto the pristine white beach. The friendly lady, spoke perfect English and even sold us take-away beers and wine and even had cigarettes if we had needed. She re-iterated before we left that yachties were always welcome. For future yachties coming this way, its the small hotel that is on the eastern extending sandspit. The island is fairly small (approximately 8 km in perimeter) and there is a recommended walk around the island during low tide. The most beautiful shells are found along the sandy beaches and lots of bird life and reptiles (such as the many geckos and chameleons). 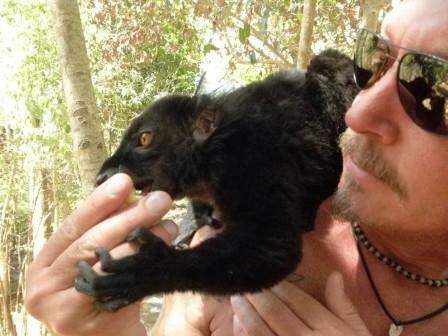 There are also forest walks, to see the lemurs and a village tour including a talk and show on Dhow building. There is a big dhow building factory on the NE beach and it is extremely interesting. I can highly recommend this island, although somewhat commercial compared to the others we have been to to-date. It was 30 degrees at 07h30, surrounded by warm 29 degree deep blue turquoise waters as calm as any lake, fringed with white sands to bright to look at, we all sat on the transom in the shade drinking our coffee, each one with their own thoughts. 15 minutes later we all had itchy feet. We changed into our cozzies and launched Landy. We tendered slowly over the incredible reefs and to the dive site. It was low tide and a squid got such a fright when we passed that he launched himself out of the water and landed 2 meters further on. This island has so much potential, and was the first place we saw tourists camping under the palm trees in the shade. 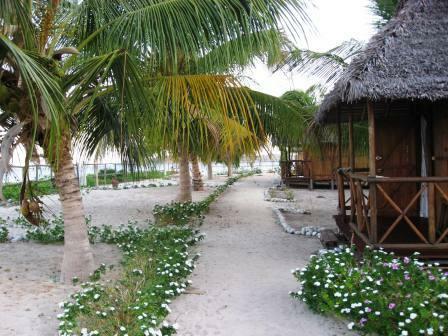 It has good water and there is a small A frame camp, called Turtle Camp, run by one of the local tour operators. The South Western side of the island is to be avoided by Yachts at all costs. The reef and bommies are plentiful and are only 1m below the waterline at low tide. This reef stretches out at least 700 meters from the coastline. After a long swim in the sea, and the chance to scrape some of the barnacles that had attached to the boat off, (within a week they grow back hence the warm water) we were ready to leave. We turned in an easterly direction, and then North on to Baramahamay (Honey) river off the mainland, for our next overnight stop. 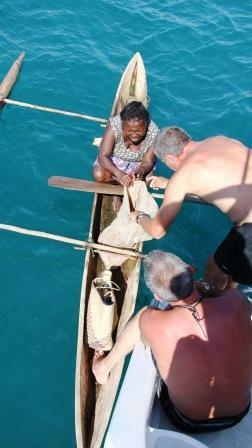 On route (and after Juju’s phone call) we were up : 2 big barracuda and 1 waka waka (Kava). The fishing invoked great excitement from Kev & Jules today as they bites came in fast and furious and the fish fought hard, making the catches so much more rewarding. They did however let them all go, thank goodness. During all this fishing hully-gully we nearly rode into a dhow again (that would be my fault, as I should have taken over the helm position, when the rods did their zing thing). We gave them a deluxe hamper. Getting rid of some of our jam, mealie meal, etc and caps. (I don’t even know why we have jam in the first place as neither of us are big jam eaters?). This was our over-eager provisioning initially. The distance we needed to cover was 15 miles. The wind was in our favour and we made good time. The entrance to Honey river is rather narrow from far, but once closer it is not too narrow. We had gotten so used to navigating islands that this river mouth entrance seemed rather intimidating. It has big high mountain peaks, covered with rainforest on either side of the river mouth entrance, and as shown on the charts, many underwater boulders at the mouth. Also, we had to find the deep channel that would lead us safely down the river. Edging closer to the Northern side, we found the deep water channel and continued down the river about 1 mile before choosing our anchorage, in 7 meters due to springs. I plotted the waypoints of the entrance in my log book for future use. We had heard that, the queen of the area, would approach us and offer us wild honey, which was delicious. Before long an elderly lady paddled up to us, in a pirogue and offered us some goods. She didn’t speak any English and it was quite a back an forth, lets assume she said this, why can’t they understand what I’m offering them, story. Eventually we struck a deal. She sold us wild honey in a 1.5l plastic water bottle for R37 and 3 big live mud-crabs for R45. For future, we had learnt that Honey is Miel in French (pronounced m’yehl). Whether she really is a queen, I have my doubts, but anyway the honey is really excellent and very reasonable. After lunch, and a refreshing swim, we launched Landy and tendered up the wide river for ages, at least 3 miles, to see the rain forest and the area. On our return we hit the beach (river beach), swam again and spent the last bit if the day, watching the locals playing with small pirogue boats, in the side streams. Another Catamaran, Rambling Rose, an old shape Dean also came in at last light and anchored directly off the village. The anchorage is very well protected and calm and the villagers do not disturb you in any way. In fact they are very humble and go about their daily chores as if you weren’t even there. After dinner we lay on the trampoline admiring the stars and the milky way, enjoying the cool evening breeze. Today we head for Russian Bay which is north for 12 miles and then sharp East for 8 miles. We planned to have lunch at Nosy Iranja. The anchor lifted, we slowly made our way through the deep channel to exit the river mouth back into the sea. As we got out of the river mouth, the howling wind hit us from the side. This was the first day of excessive wind we had experienced since leaving Vilanculos! We put the Genoa up and sailed north. It was a lumpy, swelly, ugly sea. The wind and the swells were coming from opposite directions, so the ride was not what we were accustomed too! Even the temperature had dropped to a chilly 27 degrees! As Nosy Iranja didn’t offer any protection, we decided to give it a miss and headed for a small island further North on route, which was in a bay and would give us protection from the wind. It is unnamed on the charts. This is the section on the charts, that are the start of the problems. The small island is shown on the charts twice ? right next to each other. Everything to the right of the Island is now off by 1/4 mile. We found the Island, and dodged the bommies to find a patch of sand so that we could drop our anchor, for lunch. It is breathtakingly beautiful, small, intimate, pearly white sands, tall palm trees with azure blue waters. We have called it Paradiso. (excuse the cliché). Our lunch routine of swim, eat, swim was completed and with another 8 miles still to go we reluctantly, headed back into the less than perfect conditions. At 15h30 we arrived in Russian Bay, the wind still not letting up. The suggested anchorages in Russian bay did not really cater for a Southerly wind so we had to find a new anchorage, in the bay which would give us some protection. After many, try there, what about here, perhaps here, we settled on a suitable place with some protection to anchor. It was not without incident though, the anchor would not set and after dropping and lifting her 3 times, she finally dug in and we were secured for the night. We were advised, somewhere along our travels, that the most humane way to kill a crab is to freeze it. We don’t know if it is true or not ,so we do it anyway, just incase it is true. The Crabs, we had purchased from the Queen at Honey River were on the dinner menu for tonight. Kev showed Jules how to clean them and prepare them. They made a delicious meal and everyone had yellow stained curry lips and fingers by the end of the meal. At 5h30 I was awoken to the now familiar sound of the anchor chain lifting. Kev was keen to get going, as Russian Bay was not his favourite. Jules scrambled on deck to assist Kev. I lay in a little but then decided that without my superior navigational skills, we would soon be sitting on a reef. Ha ha, no only joking, a little tinsy winsy bit of guilt crept in, that I should also be doing my share so I reluctantly got up and did my bit. The wind had calmed down somewhat and we had the most pleasant sail with both sails up, fair winds and relatively calm seas. 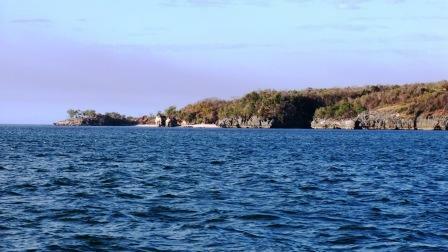 We were heading for Nosy Komba, which was 21 miles East. We passed Tani Kely but decided to give it a miss and have lunch on route so that we had more free time to spend at Nosy Komba with the Lemurs. Nosy Komba and Nosy Be are only 1.2 miles opposite each other. This small passage, which one has to pass is full of surprise obstacles. Once in the 1.5 mile long gap, we had quite a bit of weaving and dodging of bommies, reef and rocks just below the surface to do. Jules and I (with our trusty Polaroid’s) stood on the trampolines in front and guided Kev and Catatude through the maze. Fortunately it was still low tide and the water was crystal clear so it was not too difficult. I wouldn’t attempt this, at night, ever. 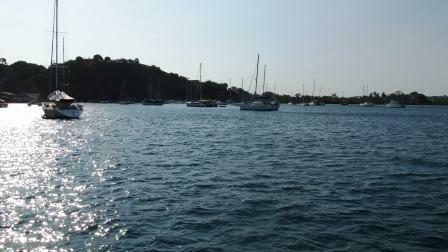 We found a beautiful anchorage between two monohulls and at 11h45 we dropped anchor. The village is big, local housing, mixed with small B&B type accommodations, as well as a few restaurants, hotels and many diving and boat excursion operators. 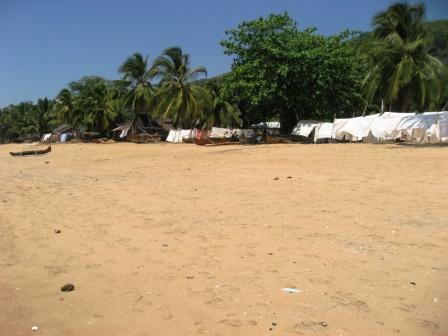 The main beach has an array of tablecloths, on display, hung up from left to right completely obscuring the village. We decided to leave our tender (Landy) and her motor in front of the diving shop, as they were busy cleaning their diving gear outside (and so they inadvertently became the guardians thereof!) and headed straight to the Lemur Reserve office. The fee was a nominal 2000 Ariary (about R8) and we were assigned an English speaking guide. As the four of us walked up the hill (not steep, thank goodness at that time of day! ), our guide pointed out the Ylang Ylang tree, pepper tree, pineapples and various other flora of interest. Just after the Church we stopped at a group of trees, and he shouted “Maki, Maki, Maki”. The lemurs descended from all directions and tamely and gently jumped on our shoulders and started eating the bananas our guide had given us. They take the banana piece so very gently from you and eat it slowly while perched on your shoulder. The Maki’s with babies did not come down the trees to us, so our guide left some spare bananas in the crook of the trees for them. They are so beautiful and their fur is very soft and sleek like a well groomed Persian cat. The pads on their feet are also very soft and callous free. They are so beautiful, but they do bite! as Kev found out when he fiddled with the ones tail! 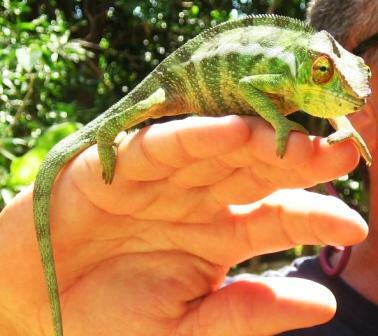 After a tour of the rest of the sanctuary where we were shown the boa constrictor snakes of Madagascar, the Giant turtle, and several local endemic chameleon species, we headed downhill for lunch. It was decided. We would have lunch at the small little restaurant with the blue and white painted picket fence, on the lookout terrace, raised 1 floor up. The owner, a young chap, named Renee introduced himself to us and served us ice cold beer and coke. We place our meal order and after 1h30 minutes our meal arrived! We didn’t complain because we watched from our 1st floor level as Renee, cooked our meal from scratch on an open fire on the ground. One fire, one pot! Shame, he did a damn good job, because all the food arrived at once and everyone’s meal was hot. We take so much for granted. After lunch we explored the village, did some curio shopping (the sarongs are really nice) and I needed to get some Vanilla pods for my sister, Jenny back home. The quality is excellent and as she is a Patisserie Chef, I was quite keen to get her some fresh pods, which I could send back to Joburg with Julius. What can I say? Its a village! Madagascar is one of the poorest countries in the world yet the people all seem happy and content to live the way they do. Everyone greets you with Bonjour or Sava when you pass them and they constantly smile. There is a central water source on the beach front, with 6 back to back cement washing troughs. These are used by the villagers for their daily wash, personal hygiene, laundry and water source. On the beach there is a small but high rocky outcrop which is the village toilet. So, no you don’t swim in the sea at Nosy Komba! The streets are a maze of small houses with windy sand streets about 2 meters wide. It was almost sunset and on the way back to Landy we spotted a beachfront restaurant (don’t think zoosh, stylish restaurant, think basic, sand floored rustic restaurant) which was filled with French people. We walked around to the restaurant and sat with Landy in view. The restaurant owner, a well built French Madagascan Lady, came to introduce herself to us and welcome us to her establishment. She introduced herself as Yolanda. When she gave her name, I instantly recognized her name. I remembered reading an article given to me by one of the Canadian Yachties we met in Knysna, that had just come from Madagascar. The article mentioned that yachties should be aware of a Lady named Yolanda on Nosy Komba that befriends yachties, invites them to her restaurant for dinner and then gets someone to rob the yachts of small valuables whilst they are away. Needless to say we finished our drinks and then left! On route back to Landy, we collected some more beer for Jules from Renee, promising to return the empty bottles the next day. Landy and her motor was still waiting for us where we left her and we headed back to Catatude exhausted after such a busy day! 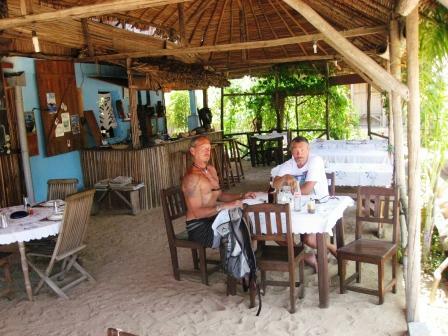 We would spend the morning and lunch at Nosy Komba and then sail on to Crater Bay to overnight. Landy was launched, and armed with Renee’s empties, we headed for shore at around 11am. I was out-voted and we went to Yolanda’s for lunch ( only because we could see Catatude from the restaurant, and because it was the best restaurant available). Whilst the Guys lingered at the restaurant I went in search of more sarongs, one for each of the ladies at our office, 18 in total. I had to get some from different stalls, so that they were all different. When I finally got to 12, I realized that they were too heavy for Jules to transport, the sarongs and the two kilo’s of vanilla I had bought for Jenny. I would have to send them home in shifts. Back at Catatude we lifted anchor and headed for Crater Bay. The reef along the mainland extends at least half a mile out on route, so we needed to make a wide berth along the land before turning into Crater Bay. We passed Hellville harbour, which is very aptly named. I wouldn’t even consider anchoring there. It is grubby and disguthting. We turned into Crater Bay, making sure to turn closest to the western shore, and along the fuel access points to avoid the shallow area on the eastern side. The mooring ball that we had pre arranged with Albert was in sight and we slowly edged up to it before hooking on and coming to a standstill. We had made it. 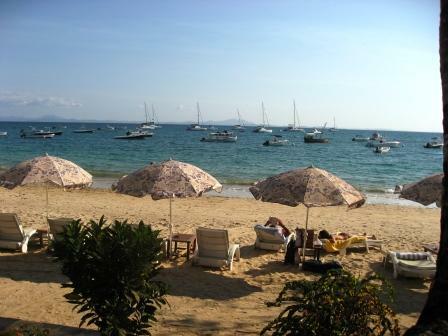 Our first goal was from Cape Town to Nosy Be, and here we were at our destination. With great pomp and ceremony, we opened the bottle of Italian bubbly that Johnny from Knysna had given us and celebrated the occasion. Thank you Johnny, we really enjoyed the champers and the occasion. Ali, the skipper of one of the Bossi Charter Cats came to welcome us and what a colourful character he was. Full of beans, quick witted and very fluent with the f word. He stayed for about an hour entertaining us with stories of some of his more eccentric clients, wishes and whims. He could write a great book of all the stories! 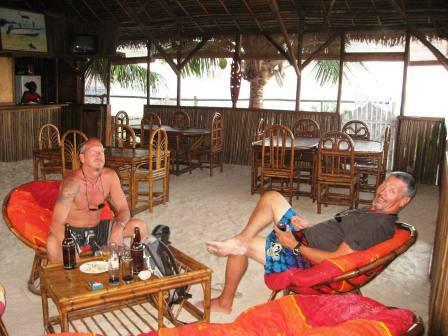 We caught a taxi to the next bay, Ambataloaka and had dinner at a really nice hotel’s beach front restaurant. It felt a little strange to be ‘on this side of the fence’, where we were the ones on shore looking out at the Catamarans anchored in the bay. We had a wonderful evening laughing and talking about the whirlwind adventure we had had in the last few days since picking up Jules in Mahajanga. As we got ready to meet our return taxi outside I could see that Jules was starting to get the going home soon blues. Back on Catatude, Jules spent several hours on the trampoline, drowning his sorrows with the last of the Madagascan 3 horse beers, no doubt planning a similar future for himself. Jules’s flight was at 9 o’clock in the evening so they guys started the fuel run early in the morning. Its rather much of a schlep, I must admit and I was very pleased that I didn’t have a very big role to play in the whole situation. First they loaded 8 x 25 litre empty cans into Landy and took them ashore. Then they came back to fetch me. I then took them both to the shore and dropped them off and returned to Catatude (Alone and driving Landy, I might remind you!). They then had to make 2 x taxi trips to the fuel station which is about 12 kms away, to fill up the cans with fuel. The return trip is ATS 20,000 more because the last 2kms is sand road which is very, very bad. And this costs extra because of heavy duty wear on the tyres because the car is overloaded! And so finally after all the cans had been filled and were at the jetty, I was summonsed to collect them. Just remember, before all this schlep : no cash, no fuel, so a visit to the only ATM which is in Hellville about 18 kms is essential. At 11 they had finished the fuel run (not full tanks again, just enough to sail/motor around for another while). We decided to sail to the next bay, where we had, had dinner the previous evening, for lunch and a final farewell for Jules. The 1 hour sail provided no fish as it was weekend and Ju hadn’t phoned! 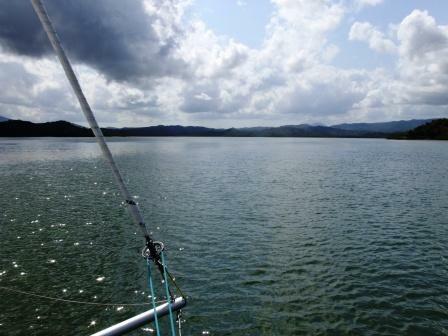 In Ambataloaka Bay, we dropped our anchor alongside the other Catamarans and tendered ashore. It is a lovely long semi-circular beach, with lots of activity. People swimming, tanning, jetski-ing, fishing, volley ball on the beach and lots of restaurants along the beachfront. Families with kids and dogs stroll along the beach. It seems like its the locals weekend beach venue? 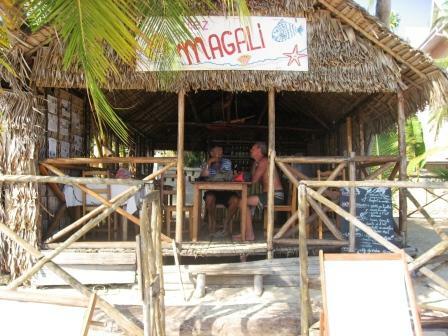 We lunched at a small place next to the Royal Beach hotel, which had fantastic food. Just before we left, we took a stroll along the beach and somehow this area feels a little like the red light district. 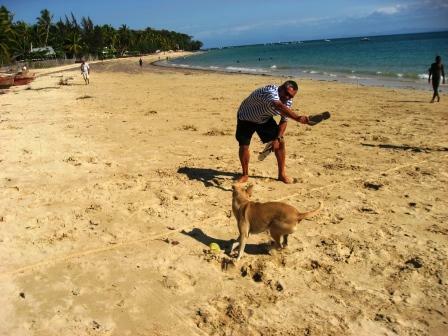 I may be wrong, but I saw one to many, very young beautiful Malagasy ladies with very elderly gentlemen and several more plying their trade along the beach? It was time to move on back to Crater Bay, so we upped anchor and sailed the short trip back to Crater Bay where we re-hooked onto the mooring ball. We had arranged for a taxi to fetch Julius to take him to the airport and when he had completed packing up his things (and some of the sarongs and the vanilla pods) he bade us a sad farewell and disappeared down the road. Well, my laxy dazy days had come to an end, and it would be back to normal from tomorrow! At least we could now explore the Nosy Be area at a more leisurely pace and I was looking forward to seeing all that Nosy Be had to offer, as well as some of the outer Islands off Nosy Be that awaited us in this wonderful country. Catatude has been the gem in the crown, she has not missed a beat through all this! Wow, that was so fast and such a overload ! I am however missing you all HARD.